It’s strange but, now forty years after his death, the image of Elvis Presley hasn’t faded but has become pretty two-dimensional. For many, the popular images of Elvis are basically that of the man who swiveled his hips and made women swoon as he sang “Heartbreak Hotel,” and that of the fat man who ate fried peanut butter and banana sandwiches and died on the toilet. To be fair, that image palette has grown a little with the releases of Elvis At Stax and Prince From Another Planet which were both released on Legacy Recordings, but the images are still pretty limited; in effect, the popular impression for one of the biggest names in music history begins when Elvis was already a mega-star, then he went to war, then he did some movies and played a few high profile shows in places like Hawaii and then he died, overweight and drug addicted. Was that really all there is to it? 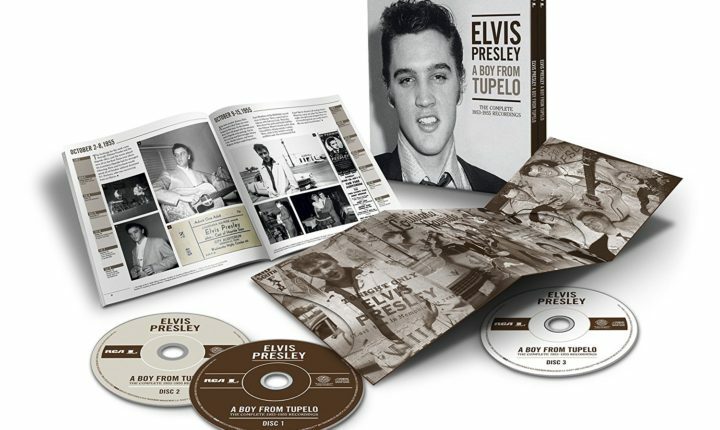 Of course not – even Elvis Presley had his salad days and that is what Boy From Tupelo – this fantastic 3CD set which collects all of Elvis’ surviving recordings from Sun Studios [there may have been more once, but they’ve long since been committed to the bulk tape eraser –ed] as well as the masters from the same period and another disc of early live and radio performances – seeks to present. At this juncture, there are some readers who might not understand the interest or what this release means, but then there are others who don’t need to know anymore; they’ve already stopped reading and gone to buy the set because the understand the rarity and uniqueness of this release. “And does it uphold on all the promise implied,” you ask? Damn straight it does. Beginning with the Memphis Recording Studios Acetates (also known as those famous “Record yourself for $2.00!” singles that Elvis made “for his mother as a birthday present – as the story has been known to go), listeners get thrown headlong into the fast times and excitement so apparent as young Elvis self-starts with little more than a guitar, a voice, a couple of ideas and several dreams. While the sound quality here is a hair tinny, there’s no question that the amount of time and care taken in post-production to make these recordings sparkle as they do was enormous; featuring exactly no hiss or bleed, these demos absolutely sparkle and offer an unbelievable amount of intimacy. None of these first four songs is rock n’ roll of the sort that Elvis would soon make famous – each is a very tender ballad – but getting to experience them in any capacity at all is a bit of magic. It won’t even take minutes for listeners to find themselves hanging on every word here, it will happen in seconds flat; the presentation is just so clean and pristine that the spell will be cast and will hold listeners of the right mind and disposition doe-eyed. Without meaning to overstate the point, it’s easy to figure out how and why Elvis’ rise to fame was so meteoric and why fans continue to buy sets like this one even fifty years after the fact – there’s an energy here which cannot be taught or learned, it is just in Elvis and was from the very first time he recorded himself in 1954. As Disc One continues, it takes no time at all for Elvis Presley to hit a stride. With the addition of Scotty Moore on guitar and Bill Black on bass, a new energy level immediately appears and breathes a kind of life into songs like “Blue Moon Over Kentucky” and “That’s All Right” that no one had ever heard before 1954, but still have sparks of the energy which would come to be rock n’ roll flashing bright on an embrionic level here – which is pretty captivating.Here, Elvis and his band slap new coats of paint and fresh vision on songs like “Milk Cow Blues Boogie,” “You’re A Heartbreaker” and “Mystery Train,” and listeners will find themselves having to activey remaind themselves to blink because hearing it here just feels so fresh and foreign. They know these songs, but hearing them at stage one – prior to when all the knicks and dings had been hammered out – is remarkable. It doesn’t take long for every listener who comes upon this set to fall under its spell because it feels like they’re bearing witness to the birth of rock n’ roll – and it feels really exciting. And, almost on cue, the sound and focus of it gets exponentially clearer when Disc Two of the set brings the proceedings over to Sun Studios proper. The difference between Disc One and Disc Two is comparable to the difference between a ball player slugging it out in the minor leagues and then moving up to play in the majors; suddenly the sound is larger and more finely produced as some fantastic vintage spring reverb touches Black’s bass and Elvis’ throat in takes of “Blue Moon,” “When It Rains It Pours” and “I’m Left, You’re Right and She’s Gone”and causes it to hit listeners like it’s all fresh and new again. There’s simply no better way to say it than that; because the sound is so clean and fresh, this music paints itself as exciting because it feels like the first time anyone has heard anything like it – and that transfers over to listeners through headphones by proxy. Simply said, while Disc One is exciting, Disc Two is the one that it’s possible for fans to listen to repeatedly because it just sounds exciting and novel unendingly; no number of listens seems to tarnish it. Conversely however, Disc Three is the comparably utilitarian offering of the set. Unfortunately, because many of the live cuts and radio broadcasts which comprise Disc Three were originally captured using the most convenient equipment that anyone had at their disposal at the time (which, let’s be honest, wasn’t even as good as the most over-used and beat-up stuff at Sun), the sound quality is pretty poor overall. Static, poorly equalized offerings and and just badly recorded efforts are the rule on Disc Three and, while completists will appreciate the inclusions of rarely-heard-at-most takes of “Maybelline,” “Shake, Rattle and Roll,” “I Got A Woman” and “I Forgot To Remember To Forget,” the sound quality detracts mythically from them and places it all into the “for completists only” file by default. Unfortunately, Disc Three proves by negative example that, while the production team responsible for A Boy From Tupelo was able to make some great silk purses, there were some sows’ ears that they just couldn’t redeem too. The 3CD Boy From Tupelo set is out now. Buy it here on Amazon.